It just gets me all excited about glue guns and craft paint. To those of you that don't have Hobby Lobby, it's like Jo-Ann Fabrics and Michaels all in one. Just more organized, and it's owned by Christians. So, I love supporting it. Thanks to my latest "Jack is in preschool for 2 hours and we have to go somewhere" trip to Hobby Lobby, I got inspired, and decided to attempt this super cute craft I saw in my new Taste of Home Celebrations cookbook. However, I'm not the craftiest person around. 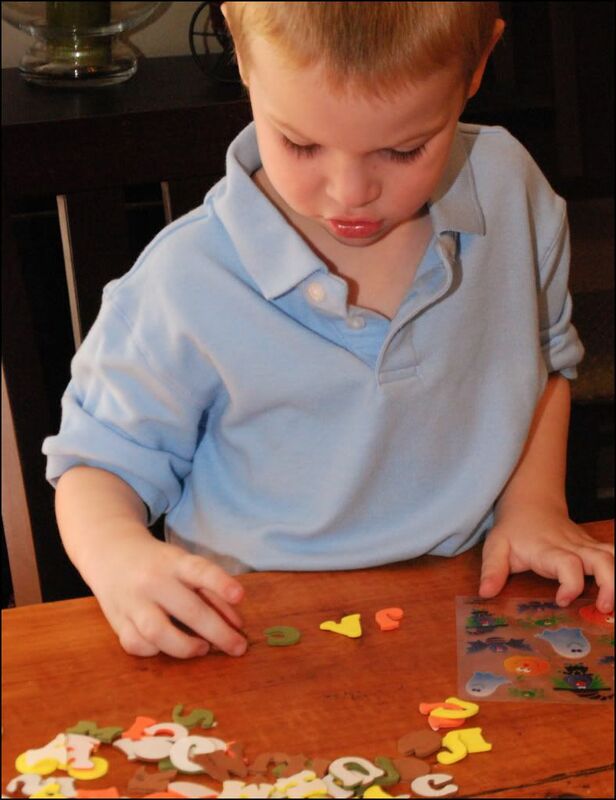 Playdoh - the store bought kind - is about as crafty as we get around here. But, I have little ones that are always up for crafts, so I'm learning. The boys helped me make the dough, and we made a royal mess of the kitchen. But, they loved making them. And, they've been eating them every day. As I've mentioned before, they need the sugar. Here are the directions for making the cookies! 1. In a mixing bowl, cream butter and sugar. Beat in eggs and vanilla. Combine the flour, cocoa, baking powder, baking soda and salt; gradually add to the creamed mixture. Roll dough into 1 1/2-inch balls. Place 3 inches apart on lightly greased baking sheets. 2. Insert a wooden stick into each cookie. Flatten with a glass dipped in sugar. Pinch top of cookie to form ears. For whiskers, press a fork twice into each cookie. Bake at 350°F for 10-12 minutes or until cookies are set. Remove from the oven; immediately press on candy corn for eyes and red-hots for noses. Remove to wire racks to cool. 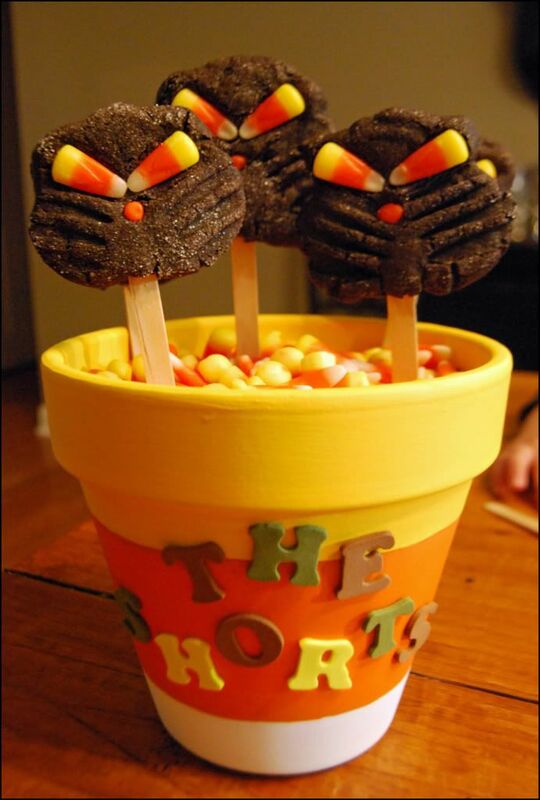 Then, we made these cute little "Candy Corn Pots". The directions are for the large pot, but I also bought two smaller pots so the boys could each make their own. According to the directions, you're supposed to wrap rubber bands in between the layers to make sure that your lines are straight. I couldn't find a rubber band in this house to save my life, so I just winged it. Here are the official directions. 1. Use ruler and pencil to measure and lightly mark a line around clay pot 2 inches from the top rim of the pot and 1 1/2 inches from the bottom of the pot. Center a rubber band over each marked line. 2. With sponger brush and white paint, basecoat bottom and top sections of clay pot, taking care not to allow paint to puddle along edges of rubber bands. Also basecoat inside of rim. Let dry. Paint outside top section and inside of rim yellow. Let dry. 3. When pain is thoroughly dry, use craft knife to score paint along painted edges of the rubber bands to break any paint seal that might have formed. 4. Position edge of bottom rubber band along the white painted edge and top rubber band along the yellow painted edge for painting guides. Paint center section orange. Let dry. Carefully remove rubber bands as before. I painted the pots; then, the boys picked out Halloween stickers and letter stickers for their names. 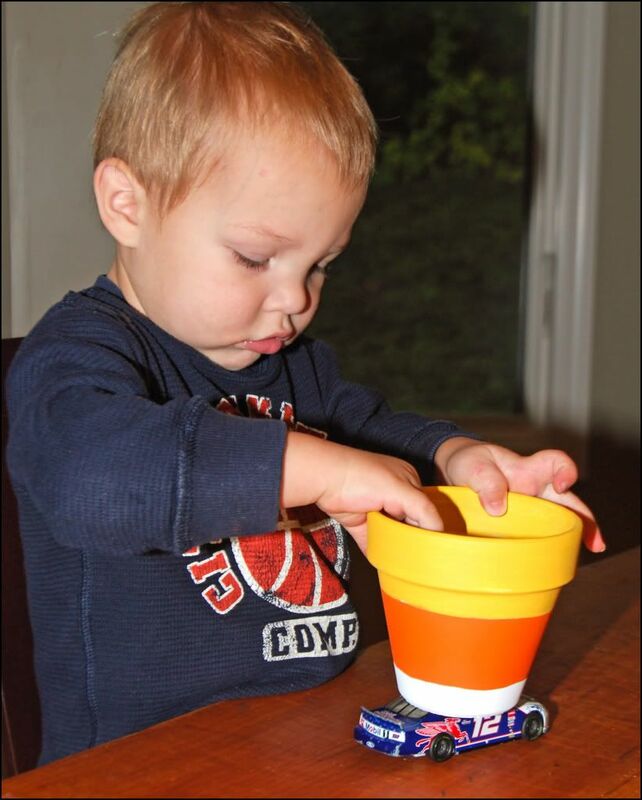 Jack knows how to spell his name, so he scoured through the letters to find his J-A-C-K.
Max - well - did you know that a racecar is the perfect transporter for a candy corn clay pot? He finally started decorating his, but it went right back onto the racecar. That boy - he just does things his own way. 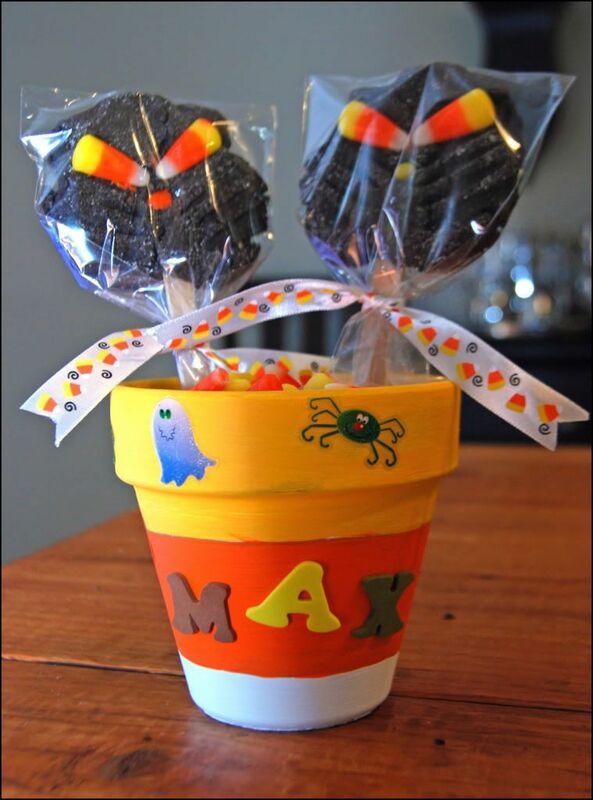 We filled our pots with candy corn, and put our Black Cat Cookies into our family pot. A great centerpiece, huh? I bought some cellophane bags and some candy corn ribbon and made up some cookie gifts that the boys can give to some of their friends. I think they look fab in Max's pot! Happy (early) Halloween - from our learning-to-be-crafty house to yours! You crafty thing! Those are so cute. When ever I have grandkids, I'll be doing things like that again! These are awesome, Sar! Those cookies look great and the pots are so much fun. Hope you're having a good Monday. well LOOK AT YOU being all crafty! i'm totally impressed. the cookies and pots are totally adorable. also, i love it that max placed his pot on his racecar. hey, why not? Those cookies look delectable...and I have a Halloween party to go to-thanks for the inspiration! Whoo-hooo! You are so inspirational, girl! Love it, love it!! Go, go, go! Those are adorable! I wish I had the gumption to try something like that with the girls. I know they'd love it. Oh so cute. I am extremely impressed and inspired, not only by your craftiness, but but by your determination to brave the whole thing in the first place! I'm pumped for when my kids are a little older and can do stuff like this. If I attempted this now, I'm fairly certain there would be much blood and tears. ARE YOU SERIOUS?! YOU ROCK THE CRAFT WORLD, SS. i think you are craftier than you think you are. both of these are fabulous and so cute. i bet the boys had a great time. thanks for sharing these with us. Three cheers for Hobby Lobby! I wish I had an inkling of creativity so I could have the excuse to be there more often! And how great our their 50% sales they always have! You are such a great mom! 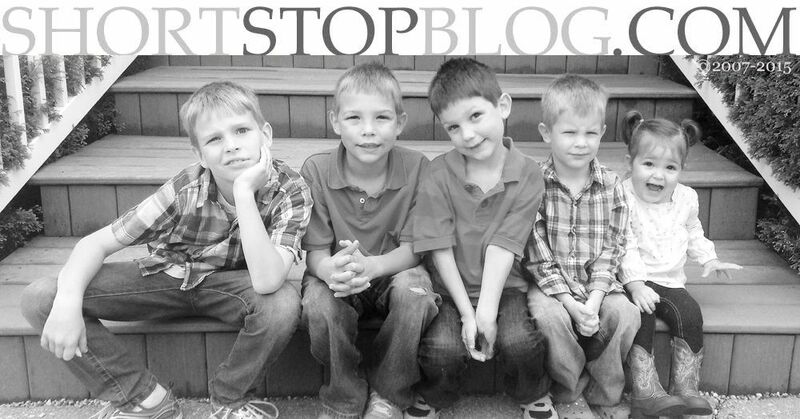 What a fun activity to do with the boys. 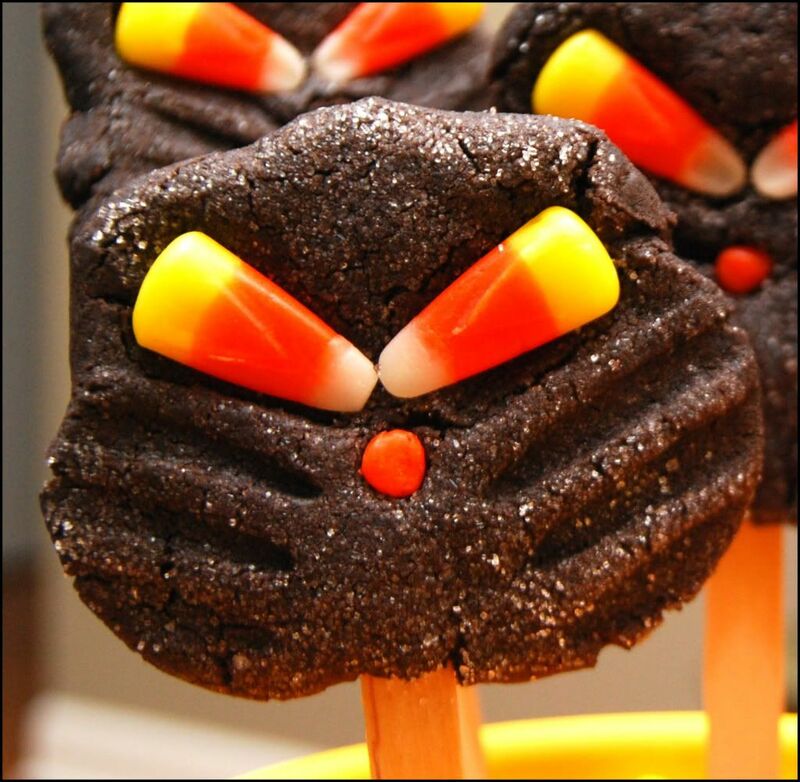 The cookies look yummy- and candy corn is way better than red hots anyways! Way to go Sarah! You get a gold star for this one! WOW! Not just an at home barista-girl who loves Starbucks Peppermint syrup but a crafty momma too. Awesome!! Be careful -you may find your name on the "class mom" list. Wow! I am impressed. Those pots turned out GREAT by winging them. Mine would be all crooked and smeared together. Good job! So stinkin cute! If I was still teaching Wed night at church- that would be such a great craft! Rock on with your bad crafty self! YOu totally Rock!! I am going to call Sarah Stewart! looks like lots of fun there. I love the cookies! Awesome. thank you for posting the cookies! I had no idea how to make them.